Keith Olbermann is leaving MSNBC, the “Countdown” host announced on his show Friday night. The liberal commentator told viewers he had been informed “this was going to be the last edition” of his show, but offered no further details. NBC/Universal confirmed the news in a statement Friday night. 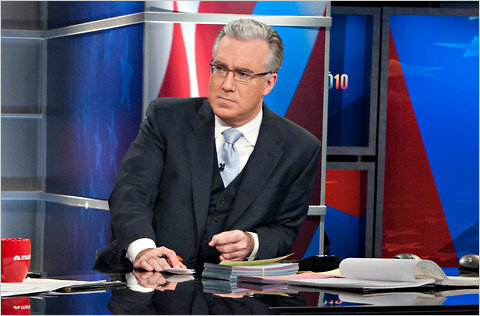 Olbermann made the announcement in his typical deadpan style, evoking scenes from the film “Network” and thanking viewers for keeping him on the air for eight years. “In the mundane world of television goodbyes, reality is laughably uncooperative,” Olbermann said before launching into a story about his exit from ESPN 13 years ago. “As God as my witness, in the commercial break just before the emotional moment, the producer got into my earpiece and he said, ‘um, can you cut it down to 15 seconds so we get in this tennis result from Stuttgart,'” he said, half-smiling, pausing for composure. There were no comments on future plans but Media Decoder reports that “one term of his settlement will keep him from moving to another network for an extended period of time.” They also report that Lawrence O’Donnell’s show will replace Countdown at 8 p.m. and Ed Schultz will move to 10 p.m. Anyone want to start a rumor that Keith Olbermann left MSNBC to become White House Press Secretary, and watch some conservative heads explode? The idea (regarding the rumor) and the underlying idea (Olbermann as press secretary) received a lot of favorable comments. There’s even media support from the idea. Among my Facebook friends giving this a “Like” on Facebook was Clarence Page of the Chicago Tribune. Also got Rick Roll’d over this on Twitter. The recent controversy over violent rhetoric from the right led to many bizarre arguments from the right as they tried to deny that there is a problem. I received many near incoherent arguments from conservatives based upon an erroneous belief that the polls showed Americans supported them in their bizarre defense of violent right wing rhetoric. This was fallacious both as poll results do not prove whether an argument is correct–a majority could be wrong. More importantly, the poll they cited was quite different from the actual issues being argued. As far as I know there were no polls over some of the key questions: Was Sarah Palin wrong to keep up the graphic of Gabrille Giffords in crosshairs after Giffords expressed fears about the consequences of this? Was Sarah Palin wrong to link to this graphic with calls to reload? Does violent rhetoric from the right pose a danger? These are the issues which led to criticism of Palin and others on the right, not whether Palin is to blame for any individual act of violence. The closest we now have to polling results regarding this issue are those which show that Palin’s unfavorability ratings have risen to new highs. Gallup found that 38 percent have a favorable view of Palin compared to 53 percent who see her unfavorably. Most likely this is not only a consequence of more people considering the consequences of her violent and hate-filled rhetoric, but also her poor response. Responding by making it appear that the entire story was about her, as well as including an anti-Semitic slur, certainly did not help Sarah (Reload) Palin.